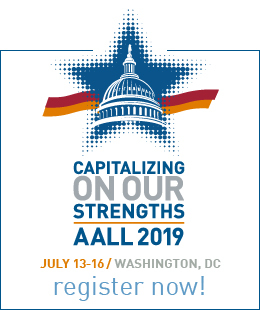 Learning opportunities abound at this summer’s AALL Annual Meeting & Conference, from the AALL Day on the Hill to the Executive Leadership Institute and everything in between. Join your colleagues and register today! Did you know that AALL offers grants to cover registration costs for the Annual Meeting or preconference workshops? Special interest sections provide additional grant opportunities for their members, and some chapters do, too. Apply by April 1. Have you pioneered a new program in your library? Perhaps you’ve created a set of best practices to apply in the workplace. Or maybe you’d like to share new classroom techniques, findings from a research project, or a practical problem-solving effort. Poster sessions are a popular conference feature, and this year’s selections will once again be on display in the exhibit hall—your good idea could benefit your fellow colleagues. Submit your proposal by April 26. If you’re in the process of developing a new, innovative, and implementable idea to improve your workplace, we want to hear from you. It’s the return of AALL’s innovation tournament! What’s the hook? Two $2,500 prizes will be awarded to further support the development and implementation of compelling workplace innovations. Apply by May 6. Applications will be evaluated later this spring; a group of finalists will be selected to present their innovation plans to attendees and a special panel of judges at the 2019 AALL Annual Meeting. AALL thanks LexisNexis for its generous support of this event. Experienced leaders understand the value of a strong network of peers to drive conversations that advance the profession as a whole. 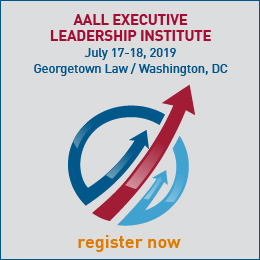 The AALL Executive Leadership Institute is a new offering designed to help executives, directors, and interim director-level professionals become more effective leaders. Learn next-level leadership skills and participate in candid, dynamic, and strategic conversations on topics affecting library services and legal information, including organizational challenges, changes in the legal landscape, and the continued evolution of information services. The deadline for applications is April 1. To learn more about the scholarships, instructions, and applications process, please contact AALL Headquarters. Thanks to AALL’s advocacy—including the many emails members sent to Capitol Hill in response to our call to action—the House voted on an amended version of the Federal Register Modernization Act (H.R. 1654) last week that preserves requirements for the Government Publishing Office and Office of the Federal Register to produce indexes for the Federal Register and Code of Federal Regulations (CFR). AALL had opposed the version of the bill as introduced because it eliminated requirements to produce the indexes. The Federal Register Modernization Act has now been referred to the Senate Committee on Homeland Security and Governmental Affairs. AALL will continue to monitor the bill and inform members of any changes. 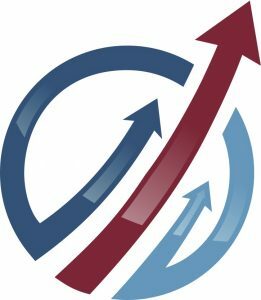 The AALL Innovation Bootcamp: Add+Venture Initiative is designed specifically for legal information professionals–cutting through the jargon and offering real-world examples of how you can amplify your skills and resources, add methods for new value creation, build support for your ideas, and foster a culture of innovation. I have recently moved from a very small organization to a much larger one. I’m hoping to learn more about innovating in a larger environment—the AALL Innovation Bootcamp will assist me in learning to navigate a larger organizational structure in terms of pitching ideas and starting new programs, and also in creating partnerships with other departments on campus. With the assistance of fellow attendees, I hope to explore innovative approaches to the technological delivery of law library services to the bench and the public. 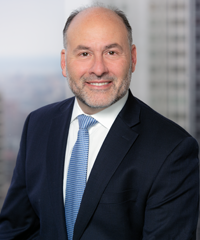 AALL is pleased to announce that Steven A. Lastres, director of knowledge management services at Debevoise & Plimpton LLP, has been appointed as the new editor of AALL Spectrum and chair of the AALL Spectrum Editorial Board, commencing with volume 24. Steve has written and presented on topics such as content intelligence, big data, legal research, and knowledge management. He has presented at the AALL Annual Meeting, Law Library Association of Greater New York, Private Law Librarians & Information Professionals Special Interest Section (PLLIP-SIS), Ark Group, and Vable. He was a co-founder of the On Firmer Ground blog, where he managed the editorial volunteer group that identified relevant topics, solicited potential authors, and sourced articles to be posted on the blog. He received the AALL Spectrum Article of the Year Award in 2012 and was the International Legal Technology Association (ILTA) Publication Award winner for Best Member-Contributed White Paper Article in 2013. He received the FastCase50 Award in 2013, which is awarded to the top 50 innovators, techies, visionaries, and leaders. He was also recognized by his peers and received ILTA’s 2014 Knowledge Management Professional of the Year Award, in addition to the PLLIP-SIS Innovative Professional of the Year Award in 2014. Steve has been an AALL member since 1986. He is currently a member of the AALL Spectrum Editorial Board and is a team leader for the Annual Meeting Program Committee. In 2018, he received the PLLIP-SIS Distinguished Librarian Award, to recognize a longtime active member whose contributions to the profession, their organization, and service to the Private Law Librarians & Information Professionals SIS have been significant, substantial, and long-standing. AALL would like to thank Kristina L. Niedringahus for her guidance and dedication as AALL Spectrum editor since July 2016. During this time, AALL Spectrum welcomed new Reference Desk columnists, established new Community and Advocacy sections, and introduced a new technology-focused column. When trying to leverage data within your work, how do you know where to start? One approach is to learn tips and techniques for developing a data science perspective. During this webinar, learn how to understand the data in front of you using scenario-based examples, as well as techniques to apply to your work. Lastly, learn about ongoing digital-based opportunities to better understand how to leverage data for your projects. Costs are exploding, staffing is tight, and budgets need to be maintained. Whether you buy or build new legal knowledge and technology products, there is no guarantee of adoption. Email announcements remain unopened, and the promise of food will not get associates to a conference room anymore. What is the answer? A panel of seasoned knowledge professionals will outline some of the techniques they use to drive, monitor, and assess digital adoption of new tools. AALL seeks applicants to serve on the 2019-2021 AALL Spectrum Editorial Board, to help develop, solicit, and curate the content of AALL’s member magazine. Serving as advisers to the AALL Spectrum editor, the board is integral in identifying, shaping, and delivering information about current and emerging trends in law librarianship. Applicants for the 2019-2021 AALL Spectrum Editorial Board should have expertise in one or more content areas, a strong professional network, and an eagerness to reach out to potential authors. Experience in writing, editing, and publication production will also be considered. Please read through the Editorial Board Member job description, and for more information visit the AALL Spectrum Editorial Board profile. Please consider lending your time and talent to AALL—submit your application by Thursday, April 25. Help ensure your peers get the perspective and insights they need to stay ahead of the curve. Established in July 2000, the annual grant funds research projects that create, disseminate, or use legal and library-related information. For inspiration, review the list of topics awarded grants in past years and explore the 16 broad research topics outlined in AALL’s Research Agenda. If you have a research project that may benefit from this grant, review the complete guidelines and apply. As the guidelines state, the research should be completed within one year and the final product should be published, sharing the results with our professional community. Grants will be awarded and announced by the end of April. A complimentary snapshot of the AALL State of the Profession 2019 report is now available. It provides a preview of the full report, which can be preordered on AALLNET. This report represents the culmination of the AALL State of the Profession Advisory Group’s efforts in creating surveys to address the nuances of each library type—as well as the input received from the legal information professional community. The report provides detailed information on a wide range of topics, including user services, skills and competencies, budgets, operations, partnerships, marketing, and technology. The AALL State of the Profession is a valuable tool for benchmarking, advocacy, organizational planning, professional expertise, and personal development. Preorder your copy today! Join AALL on Capitol Hill to influence information policy issues and harness our collective voice for the profession. You’ll learn about the information policy issues on AALL’s agenda and how to successfully advocate for law libraries. Then take our message to Capitol Hill for meetings with your members of Congress and their staff. This year marks 30 years of AALL’s legislative advocacy program; help us celebrate our anniversary by demonstrating the strength and expertise of the Association and our members. Don’t miss your chance—only 25 spaces remain. When you renew your AALL membership early—by May 1—you will be entered in a drawing to win one of three complimentary 2019 AALL Annual Meeting & Conference registrations. Committed ambassadors to the profession and the Association can add the $75 championship upgrade through the membership application when renewing. Learn more about becoming a champion member. For retired (or retiring) members, the Sustaining Member payment option allows you to enjoy the benefits of AALL without having to renew each year for a onetime renewal rate of $425. It also makes a nice gift! You have the ability to influence and make an impact in your organization! Developing your influence doesn’t happen overnight; it takes time, dedication, and persistence. You may not be able to control a situation, but you can change your own behaviors and reactions. During this webinar, learn about leadership influence, how to maximize your strengths, and how to develop techniques to influence your organization. See what else is on demand. Volunteering in an organization is a great way to gain new, or hone existing, leadership skills. Leadership in a volunteer organization isn’t dependent on title or work experience, it’s more about having enthusiasm for the organization. For aspiring leaders, a volunteer position is a great way to watch other leaders and/or to practice leadership skills. For current library managers/directors, it’s a chance to lead a totally different type of organization from the one in which you work. For those who want to become leaders at work, a volunteer position offers a chance to gain experience leading a diverse group of people. Volunteering also provides some great networking opportunities. Rachel Gordon was selected as the AALL Diversity & Inclusion Committee’s March Librarian of the Month. Roxanne Hamberry served as research librarian at Bryan Cave Leighton Paisner LLP in New York. Hamberry received her MLS from Queens College in 2008. Prior to her most recent position, she worked as a librarian at Summit Rovins & Feldman LLP and Cravath, Swaine & Moore LLP. An AALL member since 2004, she was also a member of the Private Law Librarians & Information Professionals Special Interest Section and the Black Caucus of the American Association of Law Libraries; additionally, she was a member of the Law Library Association of Greater New York. She passed away on February 27, 2019. Lisa Watkins was the former research analyst at Paul, Weiss, Rifkind, Wharton & Garrison LLP in New York. Watkins received her MS in health science from Slippery Rock University of Pennsylvania in 1996 and earned her MLIS from the Pratt Institute in 2002. 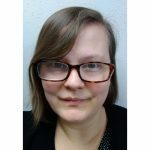 She previously served as a corporate resource analyst at Milbank Tweet Hadley & McCloy from 1998-2007, and as a corporate reference librarian at Davis Polk & Wardwell from 2007-2015. She was a member of AALL since 2002, as well as a member of the Law Library Association of Greater New York, serving as president in 2017. She passed away on March 6, 2019. In this month’s member profile, Alyson Drake, assistant director for public services and director of the Excellence in Legal Research Program at the Texas Tech University School of Law Library in Lubbock, Texas, discusses SIS membership, the Leadership Academy, and scholarship opportunities.